Neelie Kroes is the Dutch special envoy for startups till June 30. She gave a real good pep talk keynote during the Dutch Blockchain Conference in Amsterdam. Her passion, humor but also the urge to move forward with all the involved parties (banks, healthcare, energy, goverment etc) to create a blockchain coalition, to strengthen the Dutch eco system and move forward with practical applications into the European scene made everybody sit up and pay close attention. Tackling a wide number of issues, like the need for European politicians to create enthusiasm at the citizen level (like killing roaming fees) to what the startups need to do in co-operation with the enterprises made everyone sit on the edge of their seats. 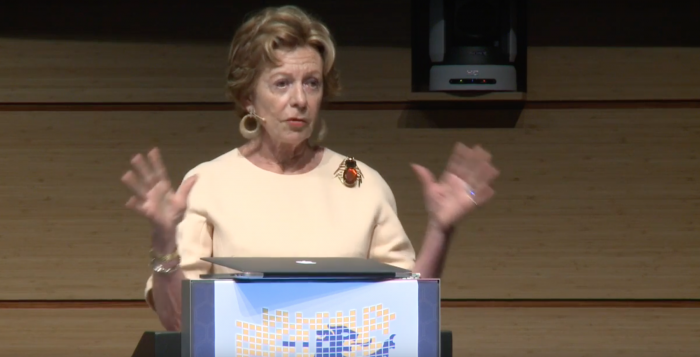 In her interview with Carlien Roodink, Neelie Kroes spoke at length about the last 18 months as a startup ambassador. As a European Commissioner she already took note of the disruptive effect of startups.